Navdeep Bains, federal minister of innovation, science, and economic development, at the U of M for a Q & A session on Jan. 8. 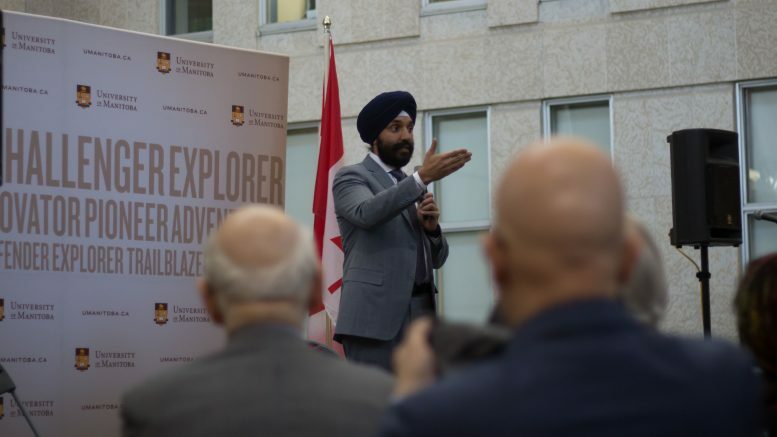 Federal minister of innovation, science, and economic development Navdeep Bains took part in a Q and A session on the government’s role in sustainable development and social innovation with U of M students Jan. 8. Held in the Engineering Information & Technology Complex atrium and hosted by director of the Asper School of Business’s Stu Clark Centre for Entrepreneurship, La Royce Batchelor, the session’s theme was created around Canada’s continued innovation at home. The first question posed to the minister was on the Canadian government’s role in the innovation sector. “We are competing with other jurisdictions when it comes to innovation,” he said. “The role of government is to put out our ability to bring people together, and to deal with these areas that are challenges for us,” he said. Bains noted that the pivotal sustainable development change forwarded by the current Liberal government has been to ensure “the environment and the economy go hand in hand.” This, he continued, creates a “compelling case” for meaningful growth. Bains highlighted that the government’s increased focus on qualitative data analyzed through Statistics Canada has enabled it to formulate tangible targets for sustainable growth in Canada’s the clean technology (cleantech) sector. Cleantech refers to technologies, processes, or services that reduce or eliminate harmful environmental impacts through energy efficiency improvements. “We wanted to understand the cleantech sector – the cleantech market in Canada – and last year, we measured this information,” he said. Bains said the clean technology sector represents three per cent of Canada’s gross domestic product, with about 274,000 Canadians employed in the sector nationwide. “This is an area where we are making big investments,” he said. The minister added that sustainable development is an important fixture of Canada’s global trade agenda, citing the government’s goal to “double the cleantech market share for Canada globally” as an example. “When we have programs that we assign, or funding that we assign, we actually have a social lens to it,” he said.